Operating a mobile storage business or other logistics service requires having your own lift equipment to move containers from point to point. Being self-sufficient in this regard makes it possible for you to deliver top-tier service to your clients. It’s not something you want to leave to a subcontractor. One of the most important vehicles you can add to your fleet is a swap body lift system. The system is fairly simple and makes it possible to pick-up, transport, and drop-off pre-loaded storage containers. The vehicle lifts the containers onto the back of the truck body where it is locked in place. This ensures both the safety of the operator and the safe delivery of the container. The system doesn’t require lengthy training or overly technical skills to operate. The vehicle itself handles just like any other truck on the road, which means drivers require no additional training to master. Moreover, the lift system features simple instructions and easy-to-use controls. Push a few buttons, tilt a few levers, and the container can be moved about effortlessly. When it is time to unload the vehicle, the lift system will pick it up off the body and set it firmly on the ground without the need for stilts or other foundations. Fully loaded containers can be lifted even if they weigh up to 13,000 pounds. The hydraulic-controlled lift does all the heavy lifting for you. Additionally, the lift system is designed to pick up different-sized containers from various manufacturers. This flexibility makes it a highly functional system that guarantees you can transport whatever containers need to be moved around. The swap body system saves you considerable time and money. Containers can be picked up and made ready for transport in just a few minutes. Upon delivery at the destination, the container can be safely moved from the truck and into position within the storage area. The speedy loading/unloading process means that drivers can make more pick-ups and deliveries per day, thus increasing your operational profitability. The swap body also helps protect your business. The vehicle’s high maneuverability and ease of operation reduce the possibility of damage. This helps protect your bottom line each and every trip. Moreover, by adding a swap body to your fleet, you create considerable flexibility for your business. There is no need to schedule deliveries and pick-ups with subcontractors; you simply hop in the cab and cruise to your destination when it fits into your schedule. This saves you time, increases operational efficiency, and makes it easier for you to deliver on your customer’s individual needs. The time and money you save is time and money you can spend expanding your operations into new markets. 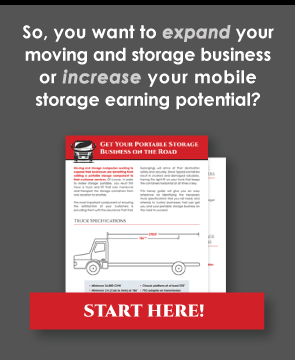 The mobile self-storage industry depends on rapid, efficient, and safe transport of containers from the customer site to the storage facility. Adding a swap body to your fleet gives you an operational advantage over your competitors. It allows you to determine the when, where, and how of container delivery and pick-up. While there are many options available for moving containers around, a swap body system is one of the few tools you can rely on time and again to do the job you need it to accomplish. The vehicle’s ease of use and simple to use controls make it an invaluable asset that you can always rely on to get the job done right.